Books are heavy! Before you try telling me I need to use e-books, I’ll add that that I wish I could, but these aren’t available digitally. I’m working on the first draft of a biopic. My biggest takeaway so far: I need a backpack. I don’t WANT a backpack. I love my cute tote purses. 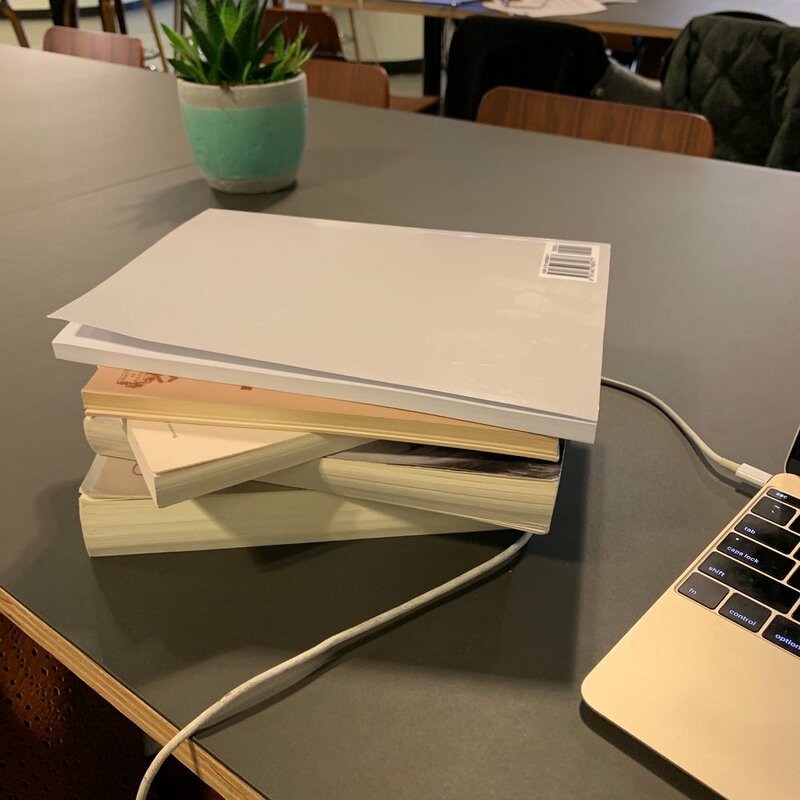 But I’m lugging at least three books to and from my office space every day (today, I needed FIVE) because of the way I’m researching each new scene I write. It’s a lot. In general, this process is a lot. I knew it would be hard. (I mean, the general fact that writing is hard has been a theme of pretty much every post I’ve written, but this project is extra hard.) I’m trying something kind of crazy though… I’m writing the film out of order! I’ve done a pretty thorough outline through the Sundance Co//ab course I took. I’m trying to craft scenes/sequences that can really stand on their own dramatically, as well as fit into the larger arc and movements of the story. It’s already such a laborious process, digging through my research books for every new sequence I’m crafting, that I’ve decided to follow the fun and mix it up. Every day, I’m working on the scenes that speak to me, regardless of where they fall in the outline. Once I’ve done a rough draft of everything, then I’ll start looking at the project more holistically. So far, I’ve really enjoyed this organic flow. It allows me to keep things fresh and interesting, and I never feel stuck. But writing something from history instead of from my own imagination is definitely a lot more tedious overall. I plan to loosen things up a lot more as I progress with the script, but I’m trying to stick a little more closely to the facts in my first pass. Thus, the heavy books. And thus, the need for backpack. I’m welcoming all stylish backpack recommendations! Why am I lugging my books so far? I am very strongly in the camp of being unable to work from home. The minute I am home, all I want to do is nap. Or procrasti-clean. I wrote for years in coffee shops, and that worked pretty well. But it’s always a tricky game of how long you feel comfortable in a coffee shop and how much money you need to spend to justify being there for that amount of time. There’s also a question of power outlets and noise levels. I actually love having some background noise. I appreciate not being in a closed room by myself, and I like seeing things and having a little outside stimulation every now and then. But finding the right balance is tricky. In the past few months, I finally bit the bullet and splurged on a membership to a co-working space, and it’s been really transformational. I appreciate having a location where I can work all day, no problem. I also appreciate the fact that it’s in my neighborhood, but far enough away from home to remove the temptation to go back (aka, nap). The particular company I use (Spacious - you can use my offer code ETACHOIR for $30 off… this is not a sponsored post, I promise) is closer to a coffeeshop than a closed, private office, so it’s the best of both worlds. That’s my life right now! Other quick updates: I booked a very small co-star role on a TV show. Stay tuned for more on that. And I bought another new plant! (Have I mentioned that I’m turning into a crazy plant lady?) Also, plant is not the right word for this one. It’s straight-up a tree.